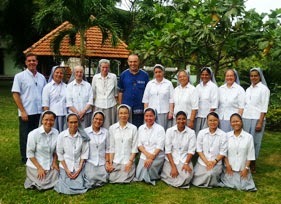 Currently the Salesian Family in Cambodia has 16 Salesians (including two native), 24 FMA (two native), 6 Sisters Servants of the Immaculate Heart of Mary (one native, with a novice), two aspiring volunteers Don Bosco (both natives), about 24 Salesian Cooperators and Past Pupils. On the occasion of the celebration of the bicentennial of the birth of Don Bosco, in January the Salesian Delegation of Cambodia has scheduled a big celebration in honor of the holy founder of the Salesians. The event, organized in three days, plan to meet in Phnom Penh to ecclesiastical and civil authorities, 4,000 Past Pupils of the Salesians and the Daughters of Mary Help of Christians and members of the seven groups of the Salesian Family in the country.